Student leaders of the Sunflower movement yesterday hosted a question-and-answer session on the US-based community platform Reddit to answer questions from around the world about their protest, in another effort to use their expertise in social networking technology to communicate with the outside world. Four students, including Chen Wei-ting (陳為廷), one of the leaders, hosted the three-hour session, titled “We are the students who have taken over Taiwan’s legislature. Almost half a million people have joined us in support,” between 1am and 4am yesterday. 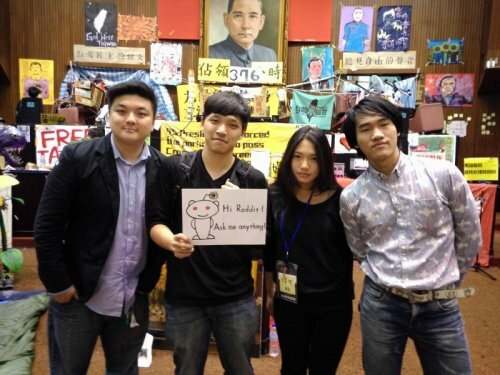 More than 500 comments were posted in the discussion thread about the movement, which began on March 18 when hundreds of students occupied the legislative chamber in Taipei. The students were continuing their siege of the chamber as of press time last night. The hosts answered a wide range of questions submitted by netizens, including why the students’ protest started, what the students’ demands and strategy are, what Taiwan’s free-trade policy is and what its trade relations are with China. Netizens were also curious about non-political matters, like how the students have been getting supplies into the Legislative Yuan and the extent of the public’s support for the movement. On a question about the interpretation of the protest, Oliver Chen (陳瑞光), one of the hosts, said that it would be difficult to frame the protest in one description or the other, and the students preferred not to interpret it in any particular way. “What we agree on is that the [cross-strait service trade] agreement is unconstitutional, goes against public opinion and is detrimental to our democracy. While there is quite a lot of different voices in the protest, for example, student groups and human rights groups who are mainly against the authoritarian manner of the government, and labor groups, who are against the impact on jobs, we do not really think that it is about any ideology in particular,” Chen said. In their discussions, the hosts also posted various links to Web sites, videos, photographs or documents related to the trade agreement and the protest. Since the beginning of the protest, the tech-savvy students have been taking advantage of communicating on the Internet and social Web sites, using Web applications such as Hackpad, YouTube, Facebook and Ustream, among others, to get their message out. They have also conducted digital video conferences with supporters — overseas Taiwanese students as well as foreigners who have staged rallies in various countries, including Japan, Australia, Germany, France and the US — for bilateral discussions.